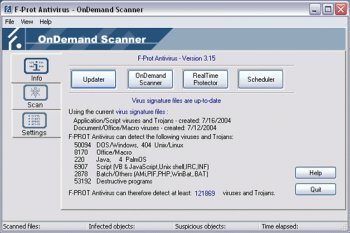 The new F-Prot Antivirus Version 6.0.7.1 has been released. Version 6.0.7.1 is an update of Version 6. This release combines the reliability and efficiency of previous versions and it comes with various new components that help to keep your system secure from viruses, backdoors, trojans and other malicious programs. F-Prot V 6.0.7.1 also features a Scheduler for you to set the auto scanning function, a memory-resident monitoring utility that observes all files accessed on your system and an Updater to manage all signature updates. Technically, F-Prot is a user friendly security software. It’s very fast and easy to use. It can operate even in a DOS environment. User can includes F-Prot in DOS for commandline scanning by just adding in some F-Prot commands in the Autoexec.bat file. This software doesn’t burden your computer resources. Generally, it is a unique, efficient, usable and affordable antivirus solution for many people. It supports all Window OS, Linux and DOS. • E-mail protection that provides automatic real-time protection against threats from incoming and outgoing e-mail attachments. • Many, many more details on the features of F-PROT Antivirus can be found in the datasheet.